With Apple's next big iPhone event right around the corner, the rumor mill is churning at full speed. On September 10th, we'll know if Cupertino's next big thing really is the long-fabled "budget iPhone." For the moment, it's still anyone's guess, but here's everything we think we know about the elusive iPhone 5c. Is it actually coming this time? By this point a new iPhone is every bit as much a part of fall as football and Thanksgiving food comas. But that pesky "budget iPhone" rumor has been kicking around for years with no results so far. So is this year any different? Almost certainly yes. Today's work is to paste protective film on the iPhone’s plastic back cover to prevent it from being scratched on assembly lines. This iPhone model with a plastic cover will soon be released on the market by Apple. We've also started to see a few somewhat believable component leaks. A few images of plastic iPhone backs like the ones mentioned by both CLW and the WSJ have started popping up, and they all look pretty similar. It's far from hard proof of an imminent release, but it's a similar trajectory to previous Apple product leaks that eventually became real. A budget iPhone also just makes sense now more than it has in the past. Android's fleet of affordable handsets is gobbling up the smartphone market, and new low-cost entrants like Firefox OS are gunning for that territory specifically. More delays just mean less available market share when the new, cheaper iPhone inevitably shows up. Update: Reports from the WSJ (which tend to be pretty reliable) indicate that Apple's preparing to ship two different iPhones next month. That's some pretty strong evidence. On top of that, a Chinese telco accidentally published an ad promoting iPhone 5c pre-orders by name. You'll notice we've been calling it the iPhone 5c; that's thanks in large part to a photo of heaps of rumored packaging. Whether that turns out to be legit or not is anyone's guess, but it at least makes some sense. It could refer to "color," given that we've already seen some leaks of a budget iPhone in multiple colors. Or, it could be a could be an homage to the Apple IIc, a smaller, cheaper version of the Apple IIe. Or both, or neither. But it's the best guess we've got. Update: There's also been some verbatim references to an "iPhone 5c" in leaked Chinese advertising. iPhones are premium products—especially the lovely aluminum iPhone 5—so a "cheap" iPhone is going to have to be quite a different animal. And it seems likely that while the iPhone 5c is clearly a member of the Apple family, it's unlike any iPhone you've seen so far. Purported product shot leaks indicate to a low-cost plastic case that's a lot more rounded than the comparatively angular iPhones of late. It's almost a throwback to the iMacs of old. A different, distinctive, and still striking style. And to add a little more fun into the mix—and probably to help differentiate the new iPhone in a more Apple-y way than just calling it "cheap"—these new devices are probably going to come in different colors. I mean, just look at all the colors on Apple's official event invitation. Hint hint wink wink nudge nudge. We've seen some rainbow cases, as well as a couple of buttons that may or may not be real, and a maybe, possibly real durability test video that looks suspicious as hell, but Apple added color to its iPod touches last year, so this sort of move isn't unprecedented. Besides, it helps that colorful iPhones could look great. Chances are iPhone 5c will be filled with repurposed guts from the iPhone 4s. That should mean 8MP cameras and the same Samsung-made A5 chips that live inside the similarly colorful iPod touches. And, of course, a fancy new lightning port. It's probably not much different than how the iPad mini brought new use to aging iPad 2 innards. Apple has always thrived on supply chain efficiency, and those component gymnastics are Tim Cook's particular specialty. Making use of older guts that are just laying around to create a whole new line of iPhone that appeals to a completely different market than the flagship is a win-win-win. Leaked cases suggest the 5c will boast a 4-inch screen though, on par with the iPhone 5, which makes sense. 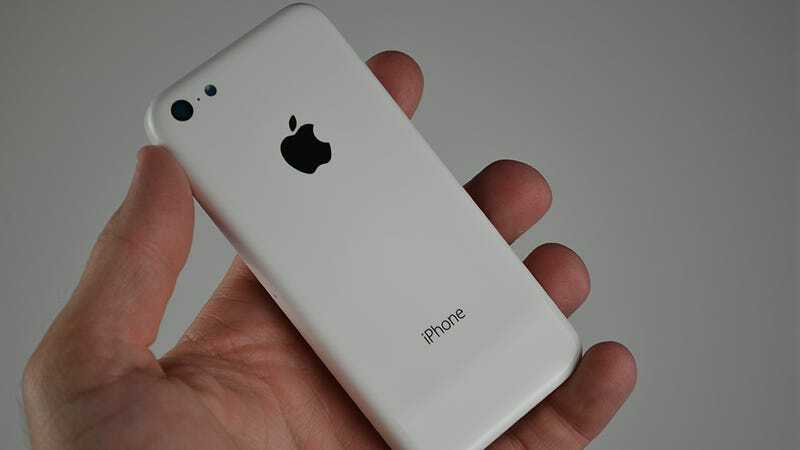 With the new flagship—presumably an iPhone5S—appearing, the iPhone 5 will be pushed down to second-in-command. Normally that'd leave the smaller iPhone 4S as your free-on-contract option, but if a 5-inch iPhone 5c can fill that role, Apple can put an end to screen-size fragmentation a year early. Apple's not going to put out a new device that doesn't run shiny new IOS7, but if the guts aren't up to snuff, you might not be getting the same features as the iPhone 5 elite. According to what we know about iOS 7 requirements, and how they scale to older hardware, it's safe to assume the iPhone 5c won't have AirDrop or in-camera filters, at the very least least. If the guts are reaching all the way back to the iPhone 4, it might not get panoramas either. But really, that's just the beginning. Chances are damn near 100 percent that the iPhone 5c also won't have whatever software-side tricks the iPhone 5S has up its sleeve, up to and including any major Siri advances. And, naturally, those older guts are only going to get dropped off the feature wagon faster than ever, going forward. It's all the shiny fun of buying a new gadget, with all the feature drawbacks of buying an old one. Probably. For as long as there have been rumors of a second iPhone line, the rumored handsets have been positioned as "budget" alternatives to the premium iPhone proper. But calling the cost is still tricky business. Not only has "dirt cheap" never really been a part of Apple's hardware angle, but it's also a part of the market that Android phones are already gunning for pretty effectively. Rumors so far are putting the price at something a little closer to mid-tier: in the $100-$150 range with a two-year contract. Off-contract and unlocked, they could go for something like $300-$400. That's Nexus 4 territory. "Budget" for Apple isn't necessarily "budget" in general, but even $400 is a lot cheaper than a brand new unlocked iPhone's ~$700 pricetag. There's a big Apple event set for Sept 10th, right on schedule for the release of a new flagship iPhone. So the 5c is look good for a September announcement. But after the announcement, there's still the matter of waiting. iPhone preorders usually start the Friday after the announcement, and sales the Friday following. In this case, you're looking at Sept. 20th as the day it actually shows up in your mailbox. At least, we hope so. We might not be able to take a whole other year of rumors.